Daniel Sturridge had waited 2379 days for a Champions League start. And while he made the perfect entrance with a goal, it was the player he replaced in the starting line-up who sealed a deserved but dramatic and last-gasp win. Roberto Firminio was replaced by Sturridge due to the eye injury he picked up at Spursbut came on for the England ace in the 72nd minute to hit the injury-time winner. On a night when over £1billion of talent walked out of the Anfield tunnel at Anfield, with Neymar, Kylian Mbappe, Mo Salah and Edinson Cavani among the superstars on show, few would have expected the opening goal to be followed by that famous yet questionable worm celebration. 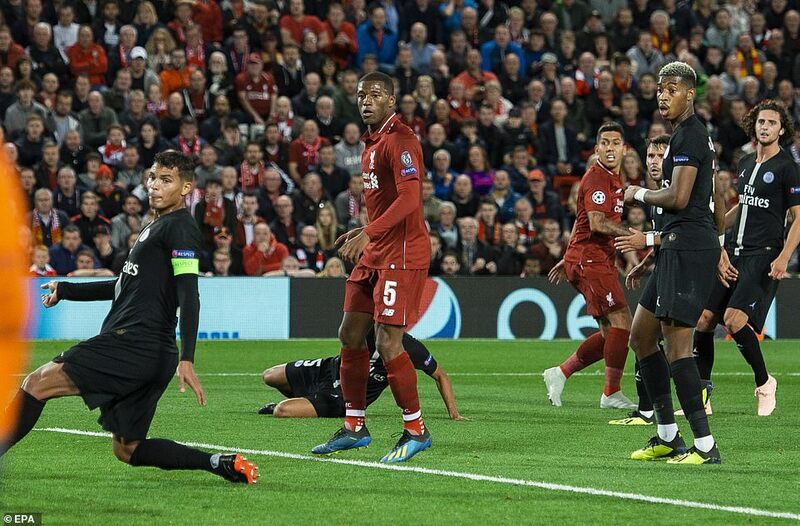 Equally, no Liverpool fans would not have expected Salah to be a villain as he was directly responsible for PSG scoring an equaliser they did not deserve – before Firmino struck. When Mbappe levelled in the 83rd minute, it seemed as though they would get an undeserved point. But Liverpool once again proved beyond doubt that they are stronger than last season. And will be even better if Salah can avoided giving the ball away when there is no pressure. 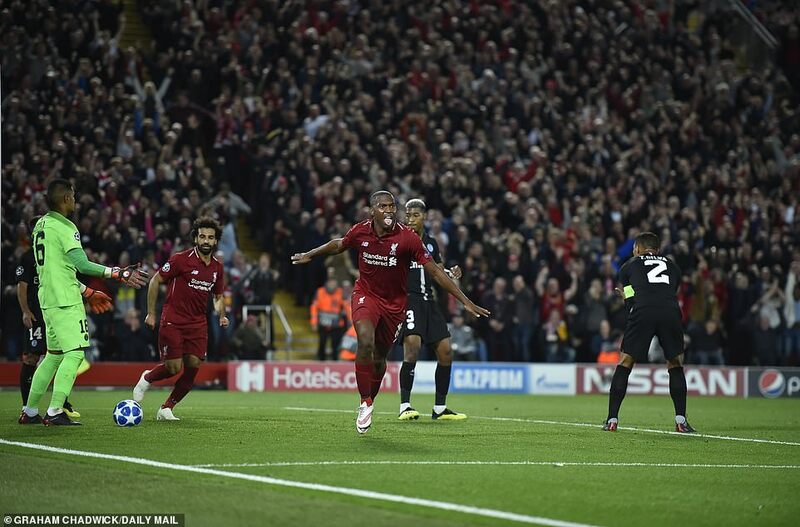 Yet the most significant moment of the night for Liverpool came in the 30th minute when Sturridge – whose previous start in the Champions league against Napoli in 2012 – made such an impressive entrance. James Milner scored the second from the penalty spot and while PSG right-back Thomas Meunier pulled one back before the break, a second half onslaught from the French champions never came. In fact, despite all their domestic success and all the money spent, PSG – despite winning their opening five Ligue 1 games with 17 goals scored and four conceded – were bang average. Salah had a goal ruled out after a foul from Sturridge and the England striker then wasted an easier chance before he made way for Firmino with 18 minutes left. Yet Sturridge milked the applause as he left the pitch and hopefully we will saw more from the 29-year-old who is maybe fortunate to still be on Merseyside under Jurgen Klopp. He certainly made more of an impression than Neymar who, apart from some nice flashes, was a major disappointment and on this showing, can forget any hopes of winning the Champions League with his current team. PSG lacked desire and urgency in the second period and equally, this was another terrific result for Liverpool just 115 days after they lost in the final to Real Madrid. 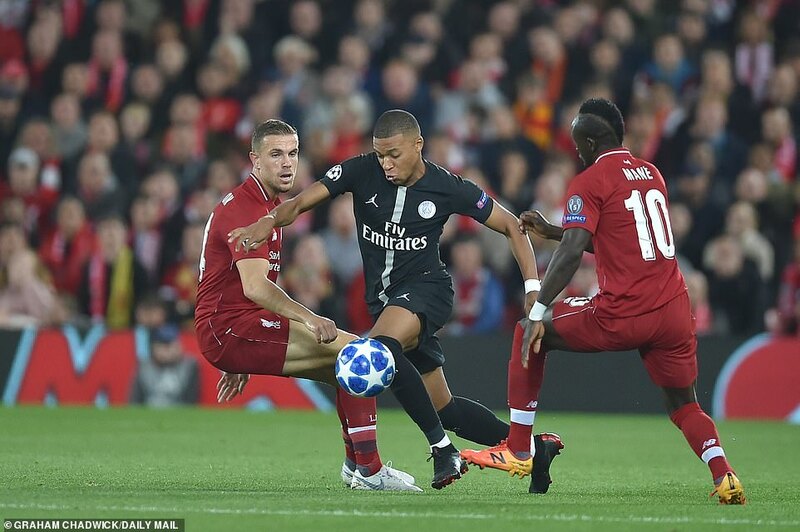 Despite the Parisians’ glittering front three, it was their keeper Alphonse Areola who was the busiest as he pushed away efforts from both Virgil van Dijk and James Milner. Areola has been told that he is PSG’s No1 keeper despite the arrival of Gianluigi Buffon, who wold have missed this game anyway for his outburst about Michael Oliver last season. And he found himself under a lot of pressure as PSG found themselves under siege early on. It took the visitors a while to show any real life up front and while Neymar hammered the ball at Alisson, fellow striker Cavani could have done better with a rebound. 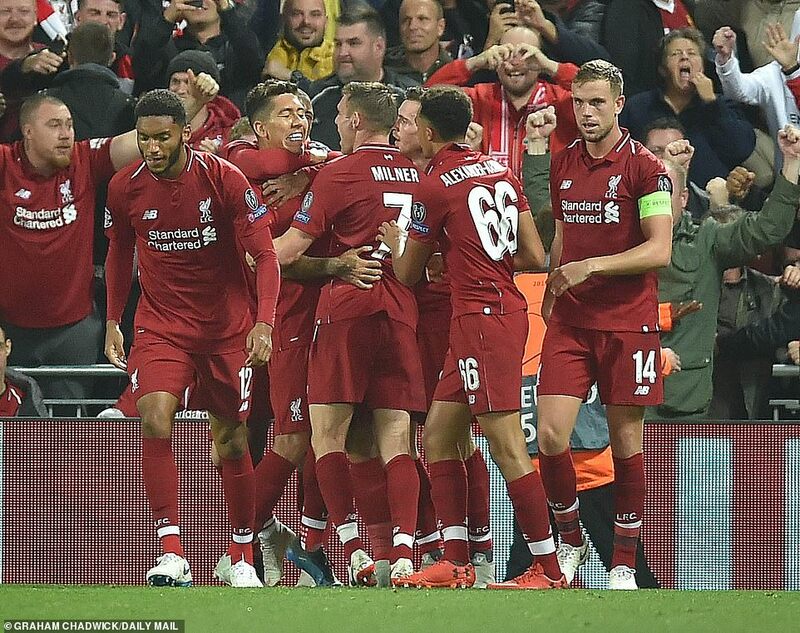 Sat on the bench, Firmino could not stop smiling and Klopp celebrated wildly as Sturridge delivered a perfectly-timed header to force the ball past Areola in front of the Kop. Trent Alexander-Arnold’s cross was too strong but Robertson’s immediate delivery from the left was outstanding and Sturridge got between Thiago and Presnel Kimpembe to score. Worse was to follow for PSG six minutes layer when Bernat delivered a suicidal challenge on Georginho Wijnaldum when there was no need and it was a certain penalty. Milner, whose previous nine goals had been scored from the spot-, made it 10 in succession with a confident, well-hit strike into the bottom right-hand corner. All Liverpool had to see to the final few minutes but a cross from Angel Di Maria came off Robertson’s leg and Meunier scored with a difficult-looking, left-footed strike into the near post past a static Alisson. PSG were lucky as Cavani initially attempted an effort from the cross but missed the ball – yet had clearly been in an offside position. Liverpool started well in the second half and Salah thought he had score his 30th goal in 30 games at Anfield. Ref Cakir was certainly slow in giving his decision to rule out the effort but he delivered the right call with Sturridge having kicked Areola in the groin. Sturridge then made way for Firmino, Sadio Mane fired an effort through Becker’s legs but across the goal and Liverpool paid for a moment of being sloppy. Salah gave the ball away to Julian Draxler, Neymar drove through, Van Dijk did not close him down quick enough and the ball fell for Mbappe who delivered a clinical finish. Yet in injury time, it was Firmino who struck, turning Marquinhos before firing the winner.